This red-orange-pink color category (just like violet) is near impossible to scan or photograph correctly. These images were scanned at 600dpi yet they are still pretty off. Nevertheless, I hope that these images can at least give you some indication of the differences between these two inks. Please note the color descriptions. Up today is Iroshizuku Fuyu Gaki (FG) and Diamine Vermillion (DV). Color-wise, these two inks are nearly identical. 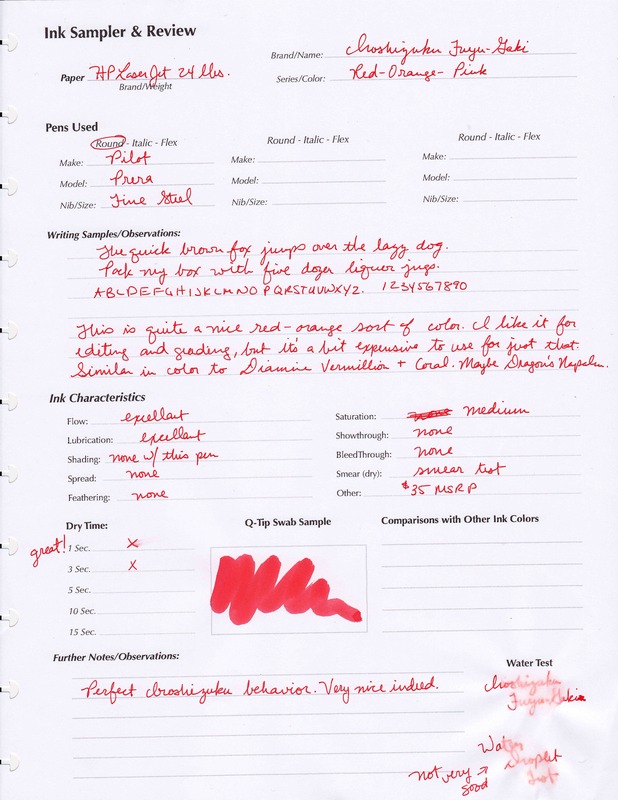 FG is a medium red-orange with a slight pinkish undertone. DV is the same color but a shade or so lighter and a touch less pink. But be forewarned, Vermillion is a very VERY dry writing ink. Perhaps it is not as pronounces in a wider wetter nib, but it was particularly unpleasant with this Prera. I’ve been asked how Noodler’s Dragon’s Napalm compares to FG. Well, for starters it is of much higher saturation. It also has a much more pronounced pink attribute to it. This is especially true when put through the same Pilot Prera Fine nib. It looks almost salmon pink through an extra fine nib. Another color that falls in this category is Diamine Coral. It is the same color as Napalm but less saturated. Napalm or Coral could be great alternatives to Fuyu Gaki if (and only if) you don’t mind a more obviously pink ink. Do you have any substitute suggestions? If so, please let us know! 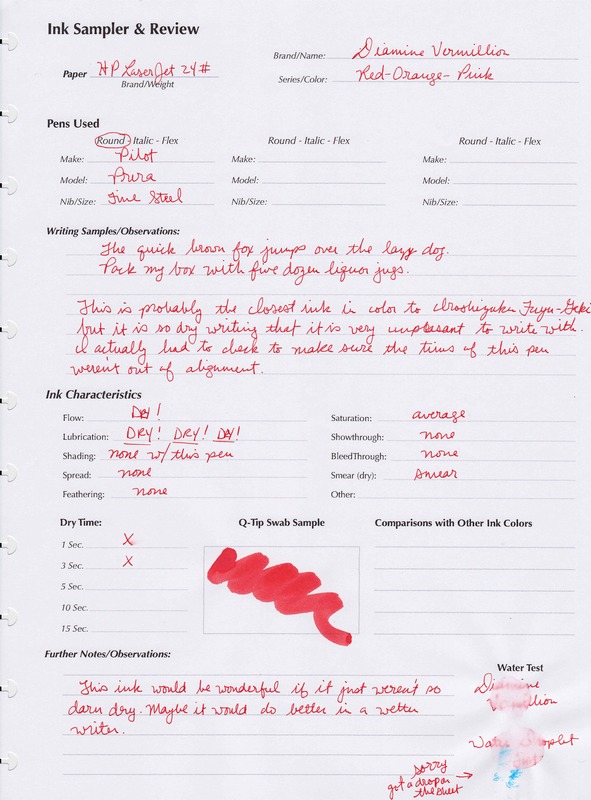 Disclaimer: The goal of these reviews is to find inks that are similar in color and behavior to the Iroshizuku line but at a lower price point. This should not be construed as an attempt to find exact replicas. That is not possible. 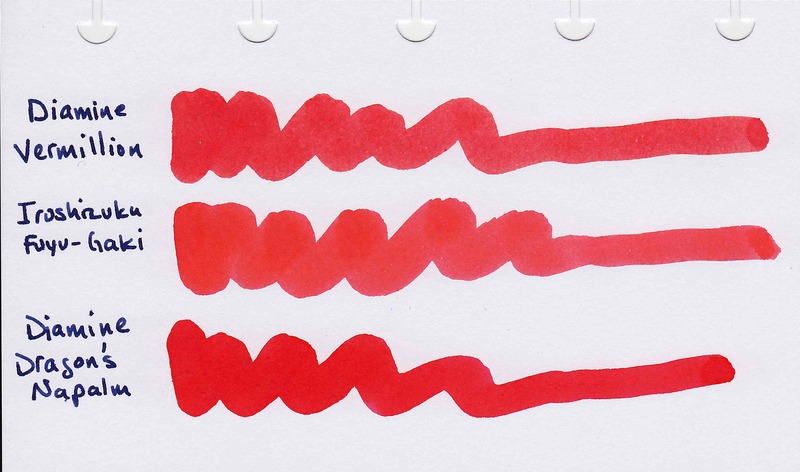 The Iroshizuku inks succeed at being unique. 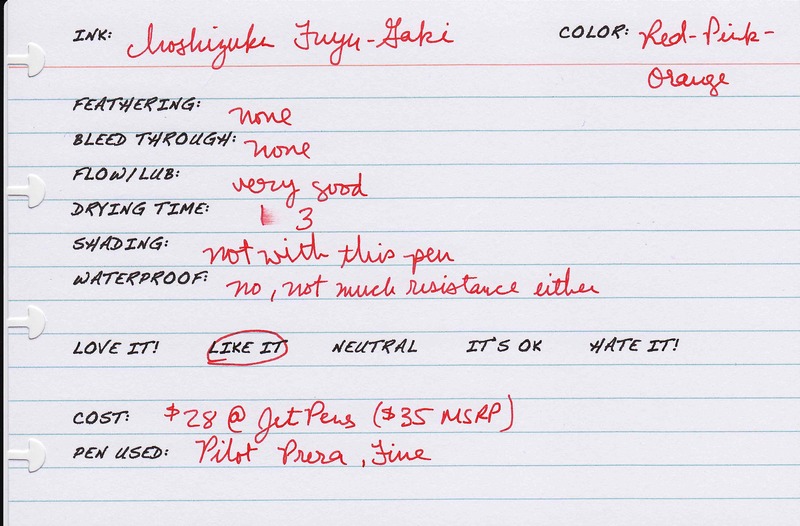 The only way you can get an exact match is to save up for the Iroshizuku. Whether or not these suggestions work for you is entirely up to you. 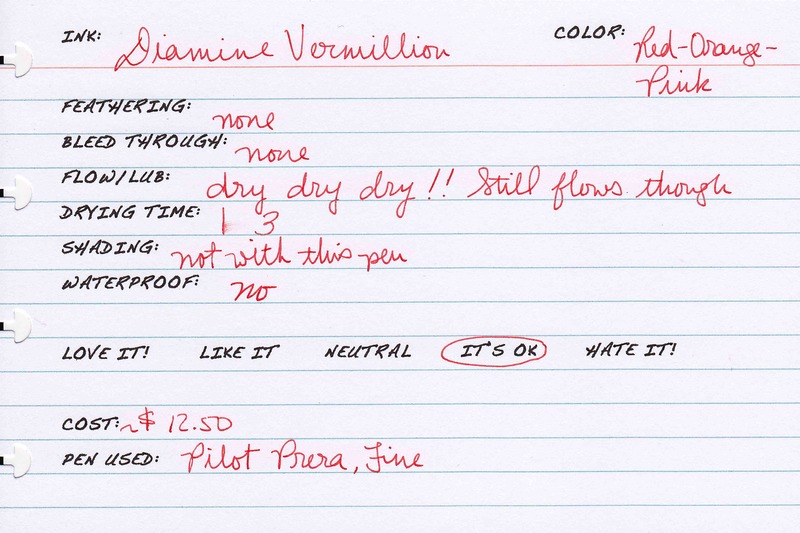 The bottle of Diamine Vermillion was sent to me for review by the good folks at Diamine. I am not otherwise affiliated with them. I was contemplating to try a sample of Fuyu Gaki but it seems that Dragon’s Napalm is even brighter. Luckily I already have a sample of Dragon’s Napalm, I just need to wait for a pen to become available. So thanks for this comparison. It saved me some debate.